OPTI-TRAP™ cartridges are application specific with a variety of packing material options for concentration, desalting, detergent removal and protein removal from samples prior to analysis. Each cartridge can be used individually or in a series to clean up samples manually, on-line using a HPLC injector or automatically with an autosampler. 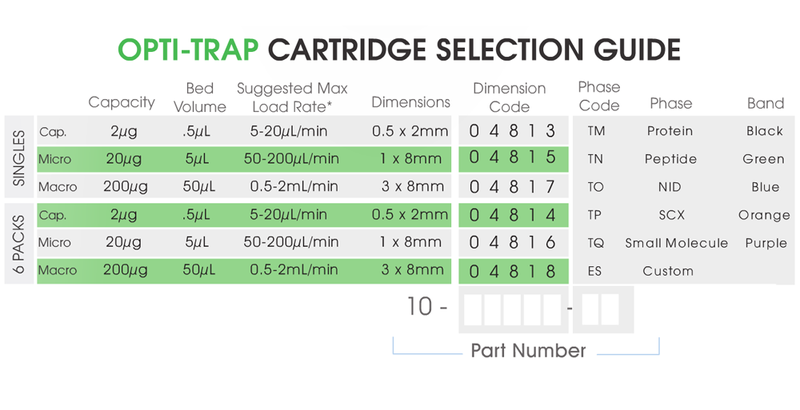 The available cartridges come in three sizes: Opti-Trap Macro, Micro & Capillary. Click the button below to add the OPTI-TRAP™ Cartridges to your wish list.